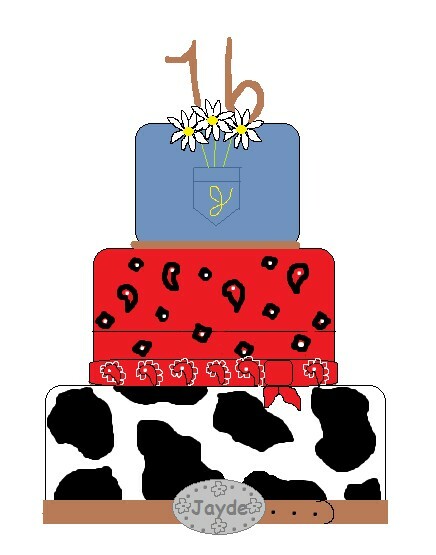 Western Cowgirl Sweet 16 Birthday Cake! YEEHAW!!!! I love doing Sweet 16 cakes. Especially when a girl ventures out of the status quo, and does something unique and off-beat! 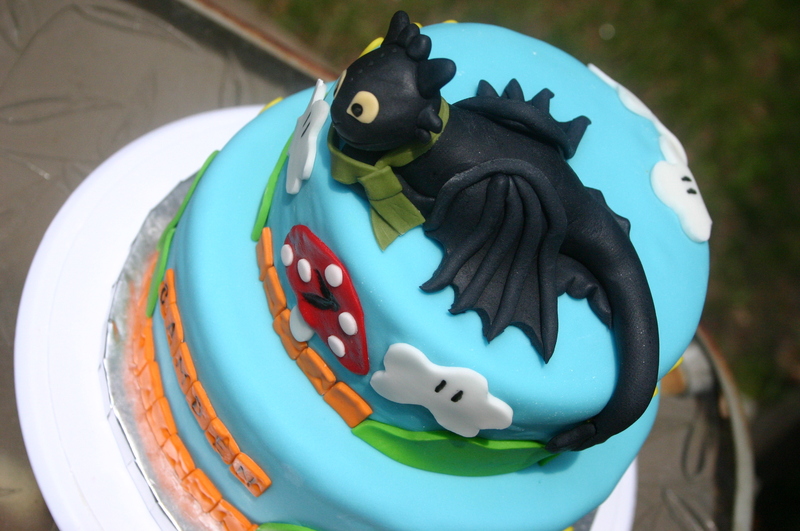 And I have to say this is one of those cakes! I mean don’t get me wrong, I love the current trend of animal prints and bright colors (i.e. zebra stripes and hot pink), but it’s getting difficult to come up with new and creative ways to make those cakes! 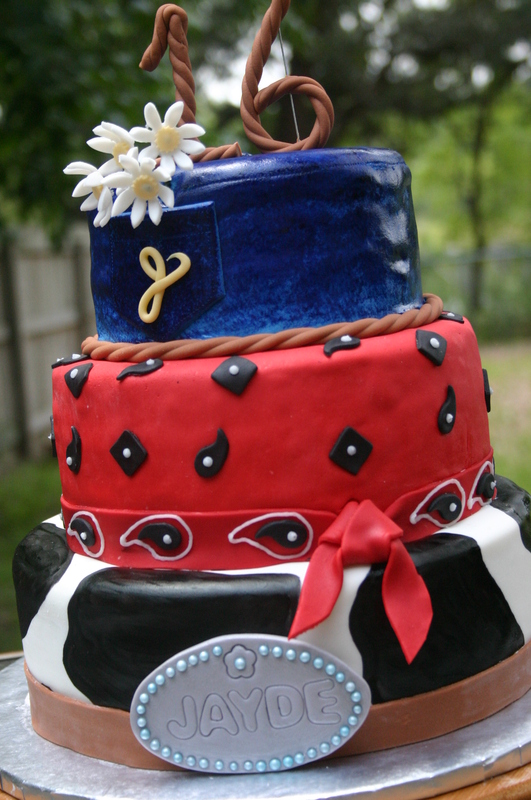 Now I will be honest, when I first saw the cake that my client wanted, with it’s country-western cowboy design, I wasn’t too thrilled. But like I do most of the time when a client brings me a picture of a cake that they found online, I tweaked it and changed it to make it my own 🙂 The more I worked on this cake design, the more I fell in love with it. Now the original design had the three tiers of denim, red bandana, black and white cow hide. My client really wanted to have her daughter’s name incorporated into the cake somehow. Well, I felt like I had an epiphany. 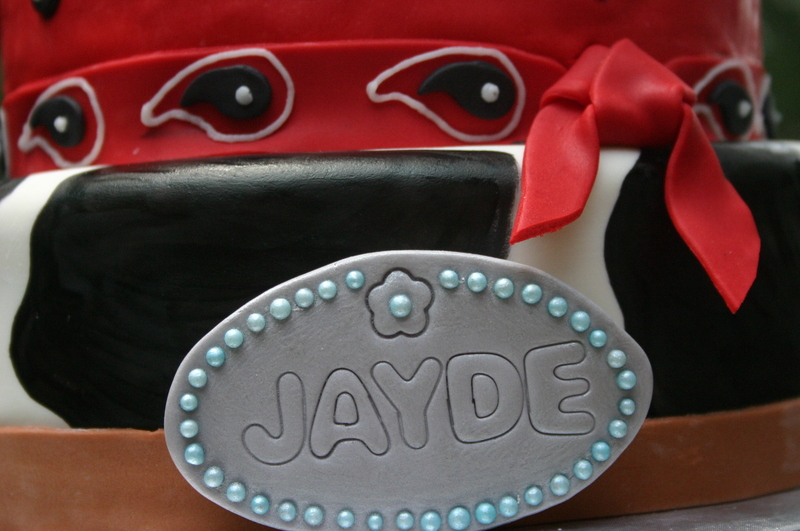 What better way to display someone’s name on a Country-western birthday cake, then with a big, ol’ belt buckle!!! I was so excited. I didn’t even tell my client because I wanted to see the look on her face when she saw my work of pure genius! 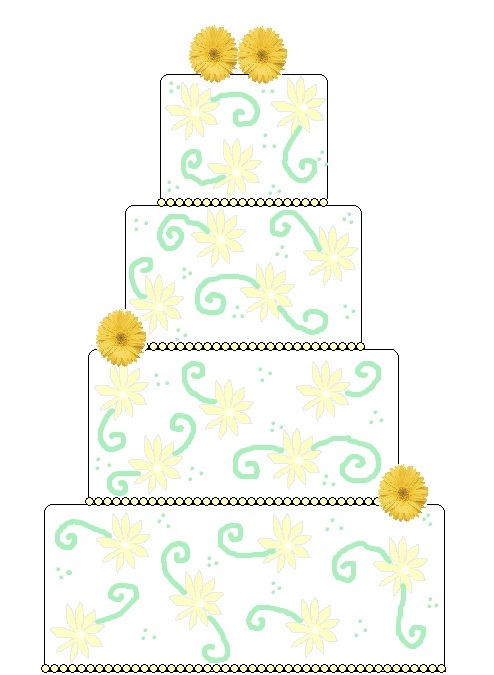 😉 Here’s the sketch of Jayde’s cake. 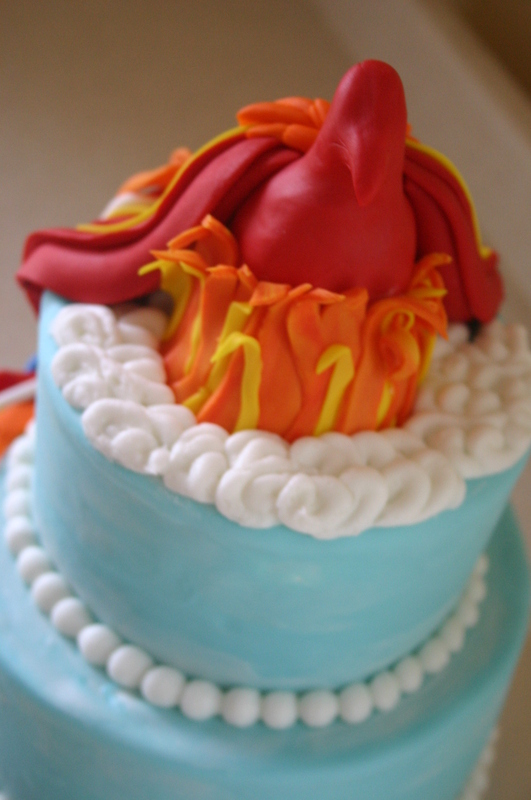 The actual Texas style cake came out even more spectacularly than the sketch! And of course the cake tasted just as good as it looked. 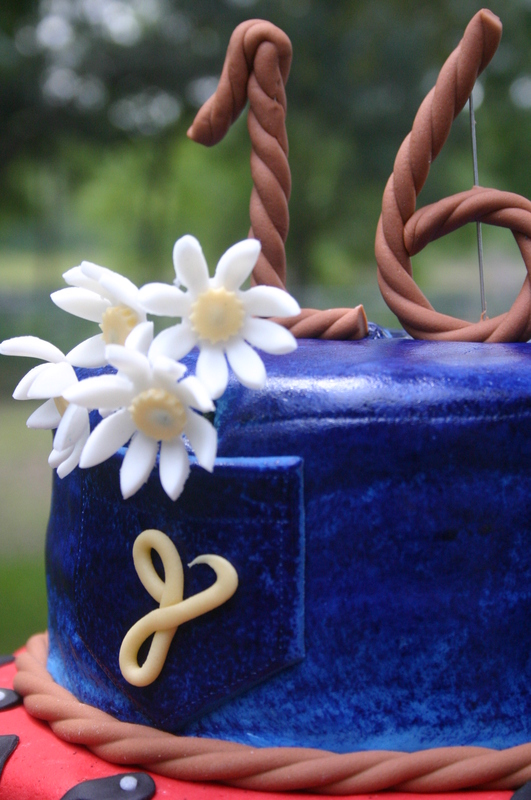 The flavors were chocolate butter cake with chocolate and vanilla buttercream and marshmallow fondant. I always love a girl who loves chocolate! Yeehaw!!! My favorite part! Jayde's belt buckle!!! Oh Brother! 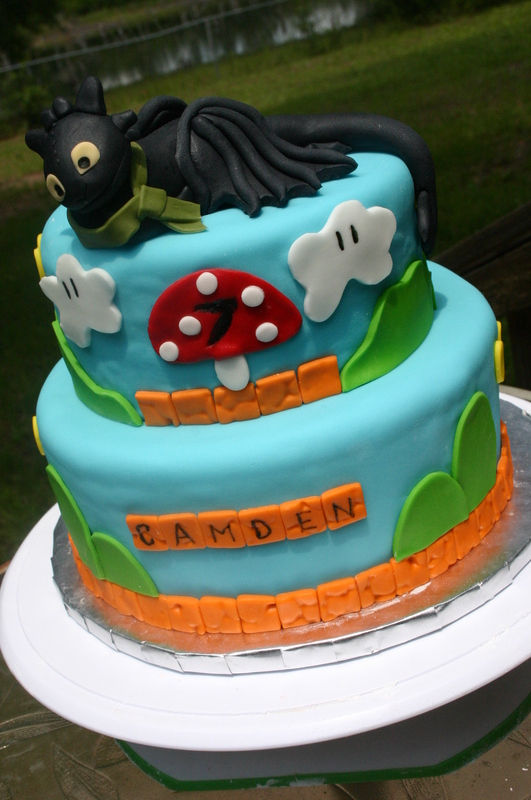 Two Crazy Custom Birthday Cakes!!! This is a warning. 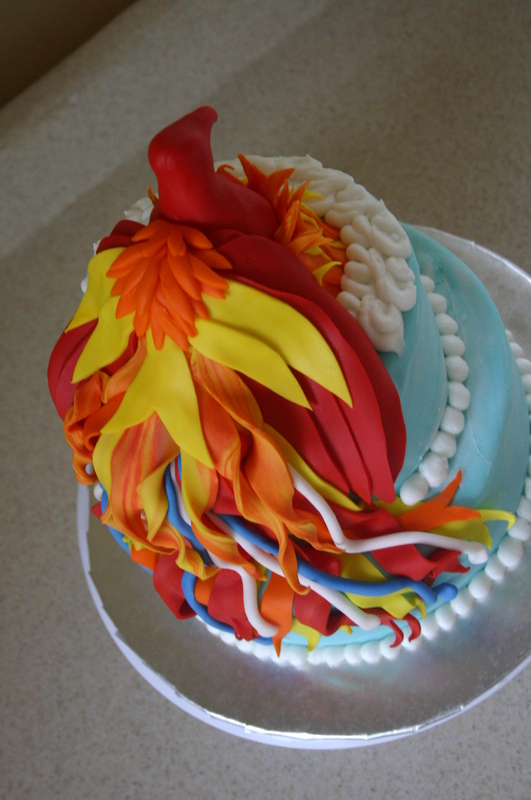 The birthday cakes you are about to see came from the brains of babes. They’re a little out-there, a little odd, even a little schizophrenic! 😉 But most of all these babies were CUSTOM!!! A couple of weeks ago I met with a new friend of mine, the lovely Mrs. Kimberly Hobbs, owner of Cafe Liquid in Niceville Florida, at [gasp] Starbucks. We were meeting to discuss birthday cakes for both of her sons, J who’s 11 and C who’s 7, and boy-oh-boy, do these boys know what they like, well except for Mr. C– he likes EVERYTHING!!! J was a little more organized. 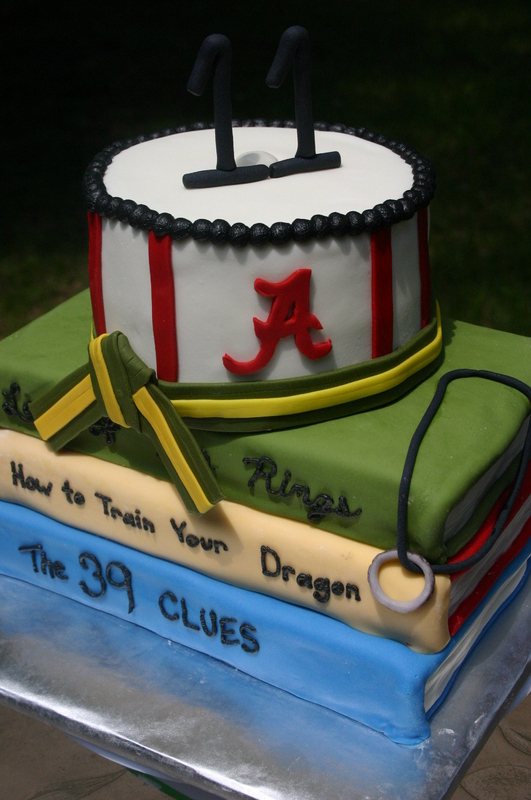 He wanted to incorporate three of his favorite interests: the University of Alabama, Tae kwon do (he has a camo belt), and reading, specifically his 3 favorite books– Lord of the Rings, How to Train Your Dragon (I didn’t realize that was a book! 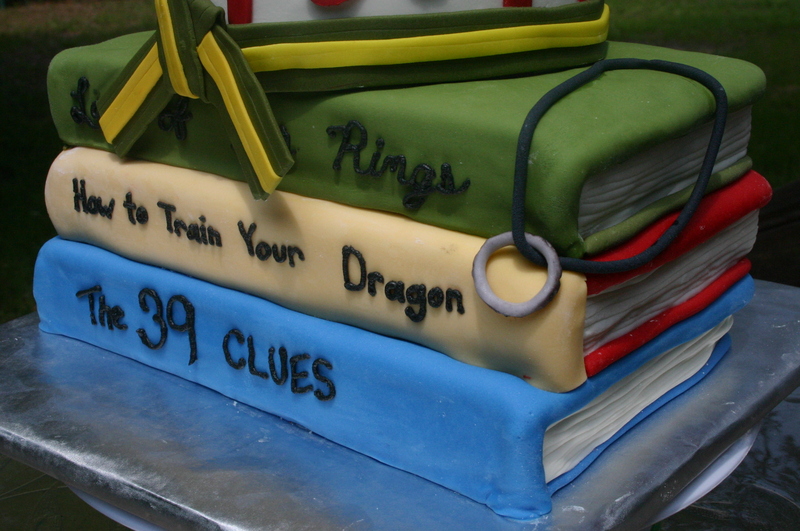 Lol), and The 39 Clues. 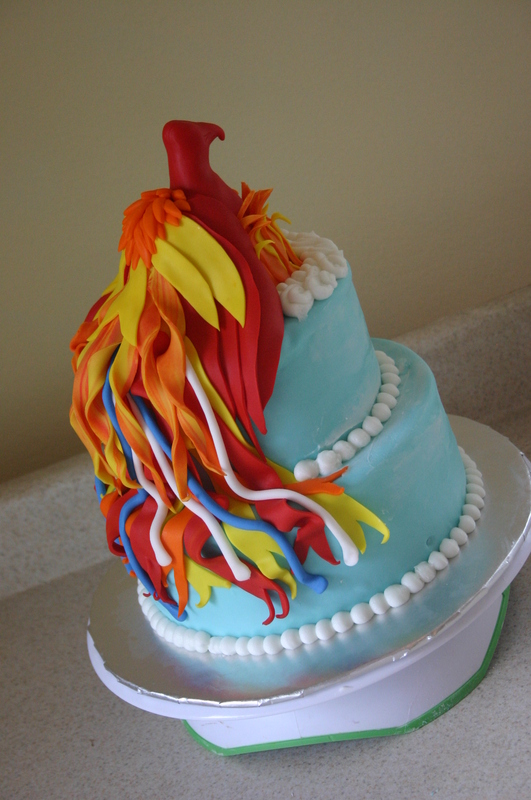 So I thought a cake with sculpted books for a base with a 2nd tier featuring Alabama and Tae kwon do would be pretty easy to accomplish without looking too crazy. 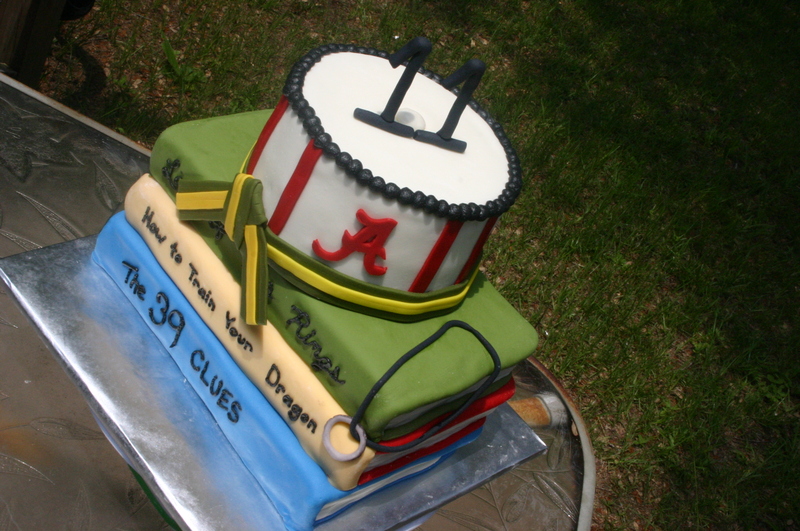 With a plan in mind for a Alabama/Tae kwon do/book enthusiast cake, I turned to hear what C wanted. These boys also knew exactly what they wanted when it came to the flavors of their cakes. 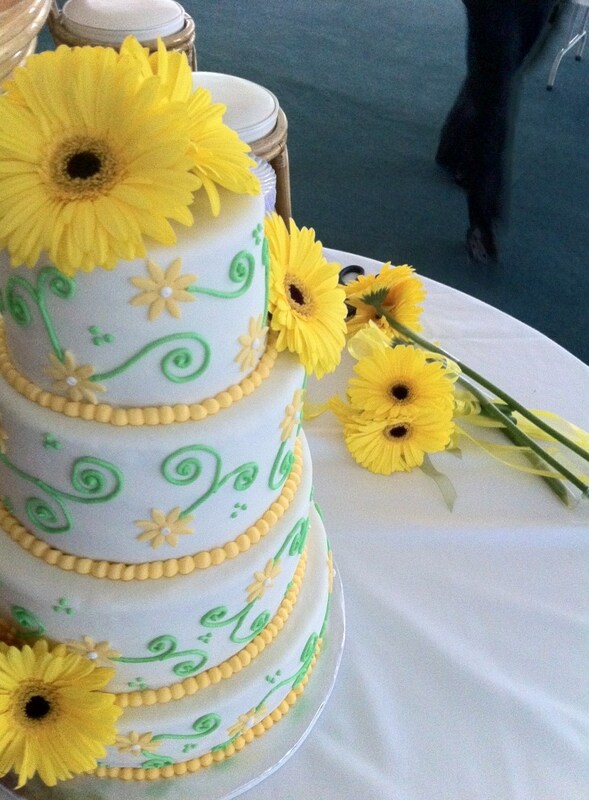 Since they were both getting 2 tier cakes, they wanted a different flavor for each tier. C wanted triple chocolate and vanilla, and J, who polled his friends LOL, wanted triple chocolate and strawberry. Since there was an issue with red dye allergy, I made a fresh strawberry cake with a strawberry buttercream filling! YUM! In the end, I loved the cakes. They were so original, and really represented each boy so well. I hope they loved them as much as I loved making them! The "ring" was from the book "The Lord of the Rings"
A close up of the sculpted "books"
As you’re celebrating today, whether with fireworks, food or friends, don’t forget those fight to keep our country free! 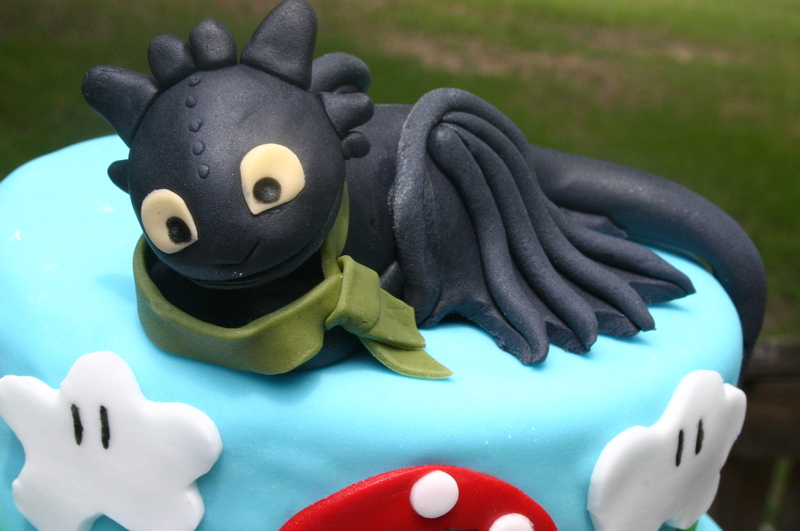 I was asked to make a cake for the brother of a dear childhood friend of mine. His family was bidding him a fond farewell as he joined the US Air Force. They actually through a going away party for him on Memorial day and asked me to make a patriotic red, white and blue cake to mark the occasion. Growing up beside Eglin Air Force base I’ve always felt a connection to the military even though my family is civilian. As an adult I have an even greater connection, since my sister married an Airman. 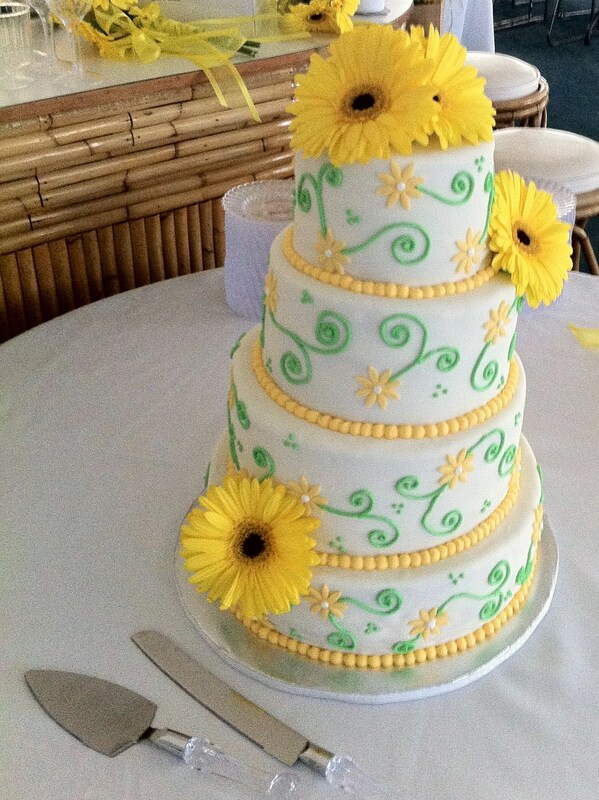 So I was thrilled to get the opportunity to make a beautiful cake for this sweet family. Even though the cake was made on Memorial day, I thought today would be a great day to share it! So I hope you all are having a wonderful holiday. Enjoy your family, friends, some good food, and definitely your freedom! Happy Fourth of July everyone! 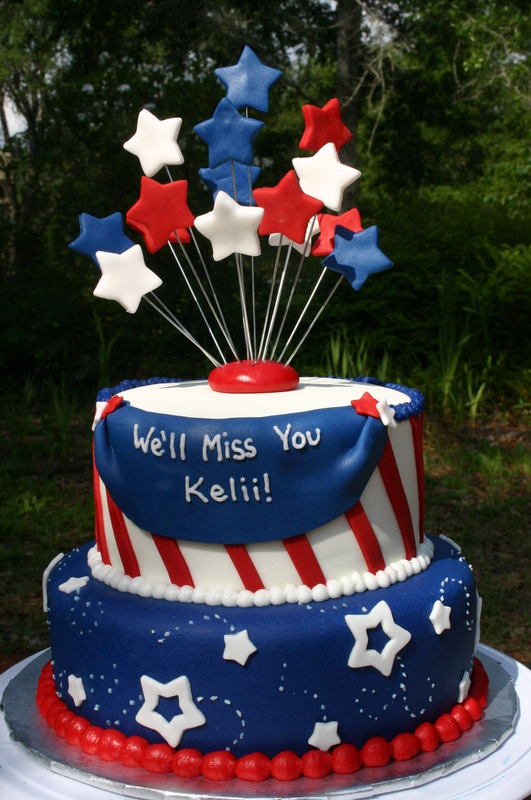 Patriotic 4th of July cake! I’ll be enjoying a picnic and some fireworks on the water in Niceville, FL with my family and friends. What are your plans for celebrating today?